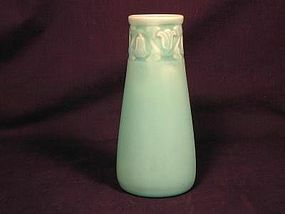 Rookwood Vase mold number 2111 dated 1926. Height: 6 1/8 inches. The color is Turquoise blue. The horizontal lines visible in one of the views are crazing lines in the glaze. There are no chips, cracks or repairs. Fully marked with Rookwood Flame mark, XXVI, and 2111 with the finishers mark of Albersman. 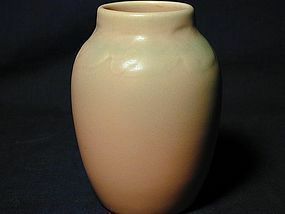 Vase shape designed by Lorinda Epply.